Clay Kaytis' Animation Podcast has been updated this week with part 2 of Clay's interview with Disney animator, director, story artist and producer Burny Mattinson. I saw Mr. Mattinson speak once at LACMA, our Los Angeles art museum, at a special screening of "The Great Mouse Detective" in 1986. Vincent Price and I believe Glen Keane and the other directors--Burny, John Musker and Ron Clements--were also there for a panel discussion. There were examples of rough animation drawings by Glen Keane in the lobby, and I vividly recall being stunned at the thought of anyone other than Glen himself cleaning up those lines. They were much rougher than the drawing I posted earlier this week--shocking, emotional, bold shapes. I remember too how genial and frank Burny was talking about the film...that sort of thing was a rare occasion in those days--a forum like that devoted to a recent animated release. "Basil"(I'll switch to the better, original title-easier to type) itself was a sort of watershed in the art and industry; "Fox and the Hound: had been a soft film, clearly aimed at small children and(with certain big exceptions, such as the oft-mentioned bear fight) unambitious storywise, and it had seemed as if feature animation might wobble along to a marginal existence at best--until "Basil"'s release, that is. 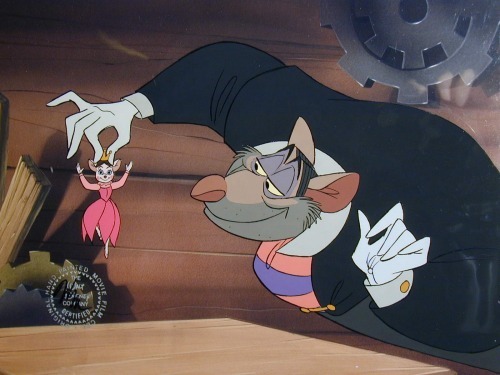 While it may look almost quaint with the hindsight of 20 years, at the time it was a blast of cool newness in animation: great entertainment: pacing, performances--in particular Basil and of course, Ratigan, humor...and did I mention the pacing? It was absolutely delightful. I saw it twice, returning to take my usually uninterested brother(a Holmes fan) who thoroughly enjoyed it as did the packed audience at the Fairfax theater(in those days, for you LA history buffs, not yet a triplex). Of course, Burny Mattinson has had a fantastic animation career(still going) of which "Basil" was but one project, but that title alone is a wonderful achievement. For some thoughts about the rest of his life and work, go check out those Podcasts. First off, thanks for thie blog. It's great. Speaking of special screenings. Some friends and I went to see the screening of Little Mermaid last night at the El Capitan. They had a panel before with Alan Menken, Don Hahn, Glen Keane, John Musker and Ron Clements, actress Jodi Benson ( the voice of Ariel), and Sherri Stoner (live-action reference model for Ariel). It was great. There is really something magical about Disney at that time. Maybe its just because i was a kid and those movies made me want to make movies. Alan Menken and Jodi Benson even performed "Part of Your World". Roger Allers was there to introduce his short which they showed, "Little Match Girl". And to top it off, Roy Disney was in audience. it was a magical night. Very Inspiring! Jenny, you're so gracious to mention the podcasts. It makes me feel like I'm doing something right to get ink from the Blackwing Diaries. High praise indeed. I'm still loving your site. Keep the goodness coming. Yes Paul, Burny is the BOMB! I love that bit at the end of part 2. He's so sweet and humble. I was there too Ed. I'm not ashamed to admit that I got a little teared up at the end of the 'Part of Your World' sequence. It is truly animation magic.